Ali ibn Mohammed ibn Abbas (Arabic: علي بن محمد بن عباس‎) also known as Abū Hayyān al-Tawhīdī (أبو حيان التوحيدي) (923–1023) was one of the most famous intellectuals and thinkers in the 10th century. Yaqut Al-Hamawi described him saying: "the philosopher of adibs and the adib of philosophers". However, it was neglected and ignored by the historians of his era. This disregard continued until Yaqut wrote his famous book Mu'jam Al-'Udaba' (معجم الأدباء), which consists of a biography of at-Tawhidi including expression of surprise and astonishment of ignoring an eminent person such as al-Tawhidi, and was adopted in the biography a lot of what al-Tawhidi wrote on himself in his books. In spite of the turmoil and different views on the at-Tawhidi's dates of birth and death, and his origin, the most correct that he is from an Arab origin, was born in 923 in Baghdad, and died in 1023 in Shiraz. Al-Tawhidi long lived a hard life and tormented. He was born in a poor family that works in the sale a sort of dates called Tawhid (hence his surname comes), and spent the rest of his childhood as an orphan in bail of his uncle which was always offending him. 1. Apprenticeship at the hands of senior scientists and writers. The Nahw Arabic grammar and Sufism on Abu Said Al-Sirafi, and studied the Arabic language and Kalam on Ibn Isa Al-Rummani, and studied philosophy on Abu Zakaria ibn Yahia Uday al-Mantiqi. 2. His eagerness to attend the councils of literature, science, and philosophy, which was convened a lot in his era. 3. Read many books on various subjects of the knowledge of that era, and that because of his long years of work as a handwriter for the manuscripts, a job which often complained about it in his writings. In spite of that al-Tawhidi tried hard to improve his status when he contacted some of the high-ranking statesmen, such as the viziers: Al-Muhallabi, Ibn al-'Amid, Sahib ibn 'Abbad and others, but it was disappointing every time, probably because of lack of luck. 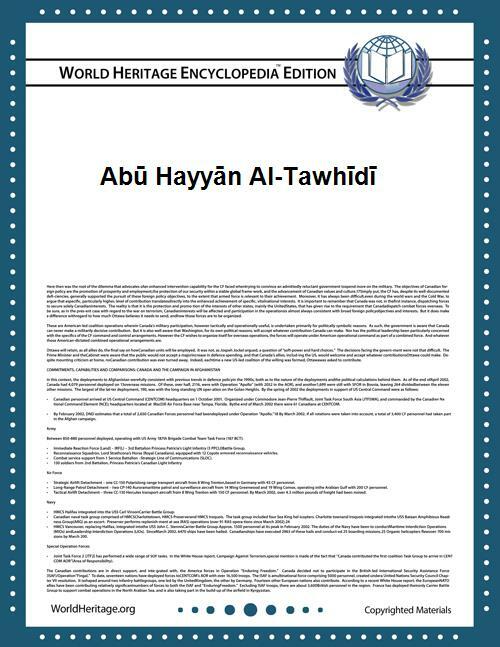 No exaggeration in saying that the life of al-Tawhidi is a series of successive failures and frustrations, the most cause is al-Tawhidi himself; he had a melancholic and depressed mood, and he was sad, pessimistic, and had resentment against others, alluring defamatory distinguished from the good people in his time, the envier own them. It was, in addition to all this, the aggressors themselves, the most literary self, somewhat ambitious rashness, so he lived most of his life suffering from violent conflict between over-ambitious and painful reality is full of all the colors of failure and deprivation. This conflict has forced him eventually to succumb to despair and Thrown resorted to Sufism to escape the bitter reality. Perhaps the burning of his books by himself which happened later in his life is a good evidence that the despair of himself and people and that he choose to live the life of asceticism in his remaining days. And also he wrote a series of letters, all are verified and printed. In terms of writing style, al-Tawhidi has never yield to the technique of Saj' and Badi' (Arabic Eloquence) which was prevailed in his era, but his style was mostly Jahizian style; and relies on reasoning, duplication, division, cynicism and redundancy, and in his writings pay a careful attention. I. Keilani, Abú Hayyán al-Tawhidi (in French), Beirut, 1950.